Today marks my second week as a permanent resident of Pittsburgh. I have thrown myself right into the mix of life up here in the ‘Burgh. Last week I ran in the Run or Dye 5k. 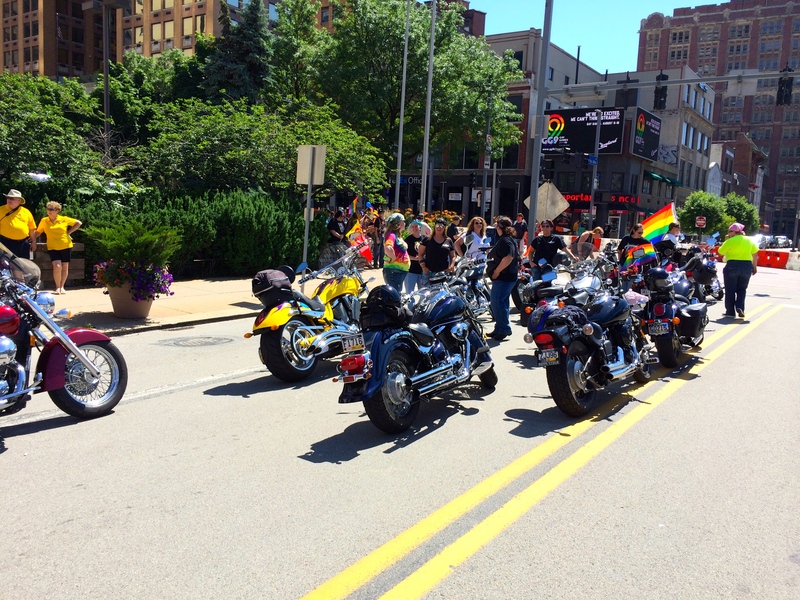 This week I participated in the 2014 Pittsburgh Gay Pride parade. I’m off to a great start in my new hometown. 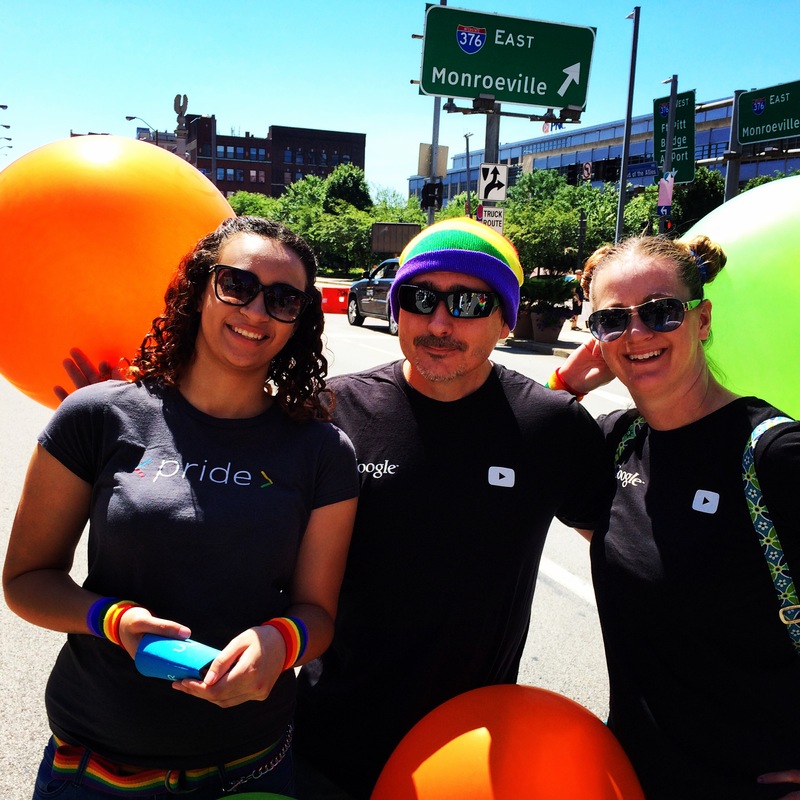 My wife, daughter, and I were part of the Google contingent in the parade. When I first arrived at the staging area for the parade, I was pleasantly surprised to see that the Google group was situated right next to a motorcycle group. As I was blowing up balloons and bangers, I kept glancing over at the bikers. Many of them were couples, sporting “Dykes on Bikes” vests. But there were others as well. Eventually, I walked up and introduced myself. I’m looking for a good group of people to ride with once I bring my bike up in July. In addition to Dykes on Bikes, there was a number of people from a local motorcycle club called “Bombers MC.” I was quickly pointed to their meetup.com site and invited to join them on future rides. They apparently regularly ride 300+ miles. I am excited; will be nice to have a group of riders up here to hang out with. Pig Kissing is a Thing? The group in front of the Googler group was Bottom Dollar Food. Apparently their mascot is a big orange pig. Accordingly, this pig was literally blown up to gigantic proportions and was a crowd favorite in the parade. It took four people to walk the pig. Our group was lagging behind the rest of the parade because the Bottom Dollar pig kept making pit stops to the bystanders in the parade. The pig’s snout would be lowered and the someone would be encouraged to kiss the snout. The first time I saw it I was pleased, giggled, and made the appropriate “aww” noises along with everyone else. After we were slowed down for the fourth or fifth time for the pig kiss, it started losing the aww factor. In fact, I started wondering exactly how many people had kissed that snout and if the snout was sanitized between each kiss. I don’t think it was. It kind of grossed me out, but at least I didn’t kiss the pig. Still, if a bunch of pig kissers get an unexpected cold, I have a pretty good idea where they got it from. If you live in Pittsburgh and don’t know about the feud between UPMC and Highmark, you’re probably living under a rock. Pittsburgh is ground-zero in their fight – a fight centered around the fact that UPMC opted to end its hospital and physician contracts with Highmark. I won’t bore anyone with the details or tell you why this should be important to you. I won’t tell you why both are spending millions of dollars lobbying at the state level to advance their agenda and why this affects everyone in Western PA. Google it. However, the Hatfields and the McCoys actually got along for the day. The employees of UPMC and Highmark are just like the rest of us. They are members of the LGBT community and they had a common bond today. It was heartening to see people wearing UPMC support shirts mingling with the Highmark folks and vice versa. Maybe, just maybe, if the corporate executives from both companies could have seen the harmony on the streets today they would work harder on resolving the dispute. This was a gay pride parade, but many, many of the walkers in the parade were straight. They were the mothers and fathers of a gay child. They were the brothers and sisters of a transgender sibling. They were progressives who just felt that equality for LBGT people is important. They showed up in droves, for reasons many and varied, to support the movement. Support was even stronger on the sidelines. The streets were lined with straight people, gay people, transgender people, young people, old people, and everyone in between. There was an air of joviality and fun. Hands were clapping and people were smiling. Thousands and thousands of people all saying the same thing: it’s OK to be yourself. Sexuality is not a reason to divide us. The love was everywhere and people were not afraid to show it. Acceptance permeated the air. It was refreshing and invigorating for everyone. There were few protestors, but they were present. My daughter asked me, “why do they show up if they know they are so vastly outnumbered?” Having been raised in a strict Southern Baptist household, I know the mentality of religious certainty, dogmatic rejection of the unknown and uncomfortable, and fire-and-brimstone judgmentalism based on the words of goat herders dead thousands of years. I had a lot of answers on the tip of my tongue, but then I remembered when, as a kid, an adult would come to the congregation after a protest. My answer to my daughter was simple. “They do it for the attention.” It’s not enough for these people to live their life by their rules, they have to try to force the rest of us to live by their rules as well – whether we want to or not. This is what they call righteousness. But at the end of the day, these protestors know that their efforts net, literally, zero gain for them. They crave the “negative” attention at the event and they crave even more the “positive” attention they get when they get back behind the doors of the church and tell everyone how righteous they were, standing in the viper’s den of evil that was the Pittsburgh Gay Pride Parade. The protestors were so inconsequential that Pittsburgh’s finest weren’t even near them or attempting to keep them separate from the LGBT friendly crowd. The police and event security were having much more fun watching the stage events and talking to people. 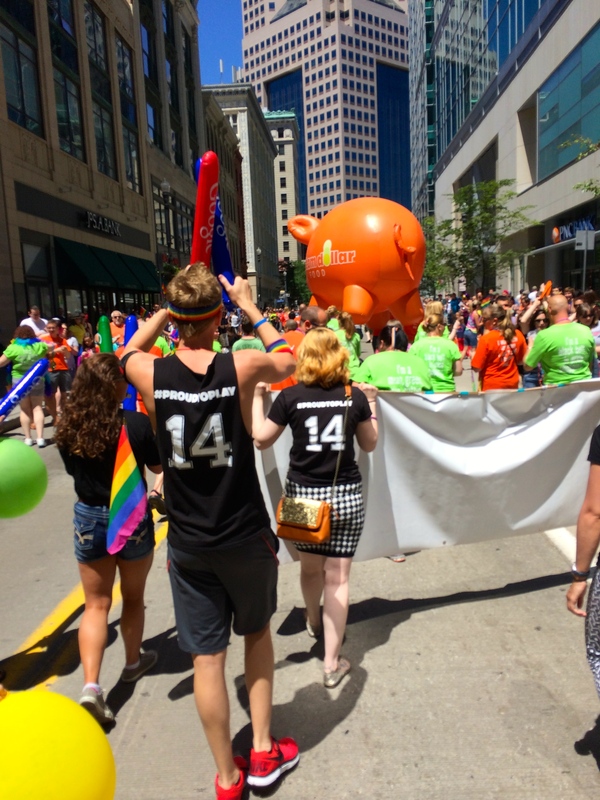 There were a total of three pockets of protest; one was at the beginning of the parade route admonishing all of the parade participants and the other two were at the PrideFest shopping, concerts, shows, and events after the parade. The protestors, with their megaphones and signs of condemnation quickly found that there was no line of protection between them and those upon whom they were casting judgement. Flamboyantly dressed cross-dressers were putting their arms around them. 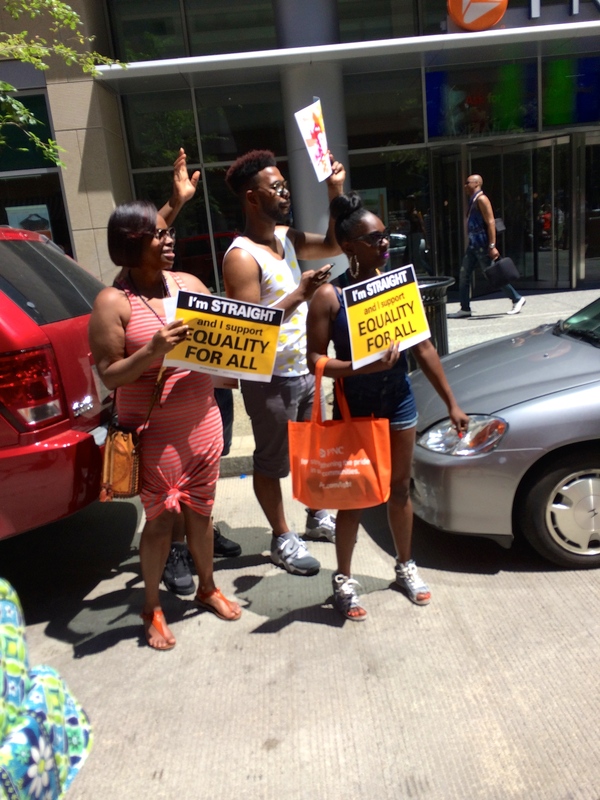 Scantily clad men were parading in front of them, and others were changing their message. The marginalization was so complete that from five feet away you really couldn’t even see the protestors. And no one crossed a line into violence. It was simply awesome. But I liked it. There was a group of people dressed as characters that I did not recognize. I suppose if I were more involved in the LGBT community I would understand it, but it went right over my head. The guy pictured here was dressed as a red angel? Demon? I am not sure. But he was just one of many. There were painted bodies with skull faces. Women wearing horse heads. Other riding hobby horses. I’m sure a reader of this post will tell me the significance of what I saw, but until then I will appreciate the theatre of it. 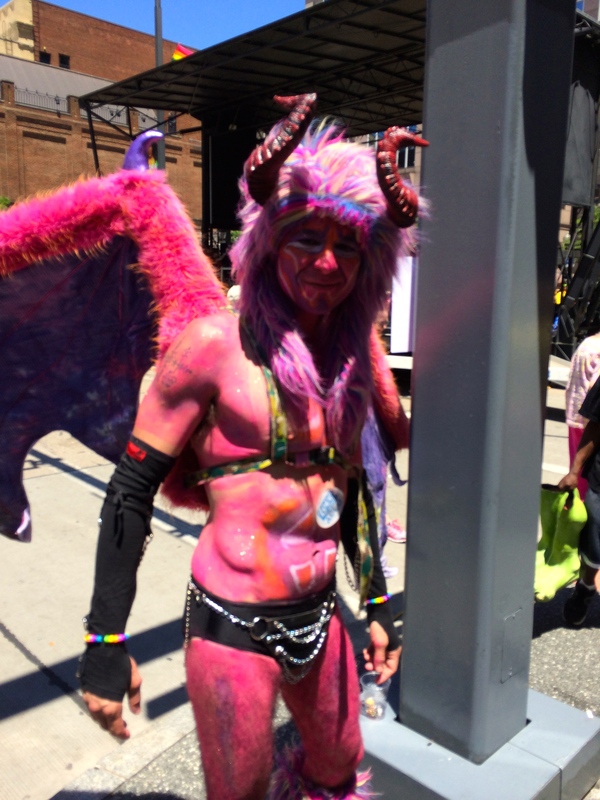 The time it took to paint their bodies, create their outfits, get ready, and then walk the parade and pridefest dressed in costume was awesome. My virtual hat is off to you. I think I need to find this dude and get costume tips for Halloween. I was starting to get crowd weary by this time, so we didn’t stay long, but this performance at one of pridefest was pretty cool. She was lip-syncing Lady Gaga and the crowd loved it. She had all the moves, had the crowd clapping and singing along, and got us all in the mood to party. Even introverted me, tired, hot, and ready to go home was clapping along and smiling. My daughter was disappointed that we did not stay to enjoy the entire show and now that I am home, I regret not staying for it as well. All I can say is that when an introvert is done, he is done. It was time to split. My wife works for Google. Last year she had just started working for the company and did not participate in the parade as a Googler, but this year she did. And brought me and our daughter along. 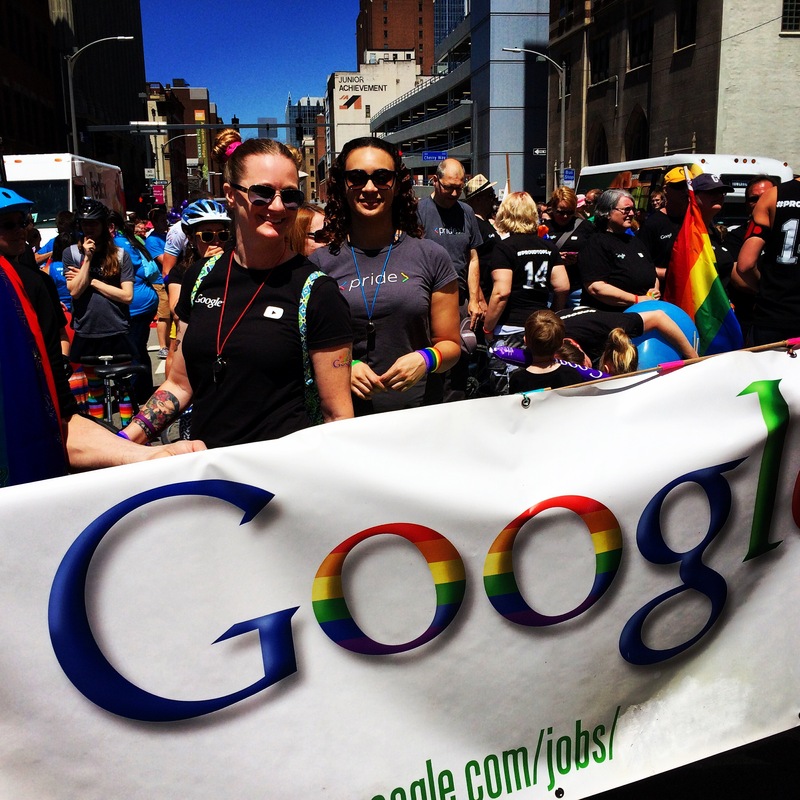 I learned today that Googlers lovingly call their gay employees Gayglers. Gayglers are proud to be called thus and enjoy a judgement-free, full acceptance environment at the workplace. Googlers brought their wives, husbands, partners, small children, and friends. We all came together to support not just the Gayglers in the group, but the entire LGBT community. Google is well-loved in Pittsburgh. When we paraded by the announcer-booth and were introduced as Google to the crowd – the crowd went wild. Far and away the applause and hand-waving from the people watching the parade was longer and louder for Google than it was for the kissing pig in front of us. I love my wife and daughter and am proud of them. I can think of no better way to spend Father’s Day than to have been in the Pittsburgh Gay Pride Parade with my wife and daughter. I am heartbroken my sons in Florida were not able to be here with us, in this parade, but they called immediately after and were jealous they couldn’t make it. They wanted to be here to support LGBT equality as well. I am so proud of all of my family. Every parent needs to accept their child and love them – the sexuality of my kids has nothing to do with how much I love them. I accept them for who they are. I saw this same sentiment in so many families today. Fathers, mother, brothers sister, cousins, aunt, uncles – healthy and strong families were all present. Some of these families had a member who was gay. Some did not. Some had transgender members. Some were gay couples with kids. Some were gay grandparents with their heterosexual children and grandchildren. There were lesbian couples dressed as wonder-women pushing their kids around in a stroller. There were lesbian couples cradling a newborn baby. There were gay men swinging a child between their arms. There were heterosexual men and women tying shoes, wiping noses, and chasing their kids. Families are strong when there is love and understanding between the members of the family. I saw that everywhere today. The parade route was exactly one mile. I tracked it on my Nike+ watch. Here are some other pictures of the parade. Click for larger images. I had a great time and was pleased to learn that Pittsburgh is such a progressive and accepting town. My new hometown made me proud today.